Reporting tools are at the heart of your performance. Clear, precise, easy to obtain, they guarantee decision makers an inexhaustible source of indicators obtained directly from their data. Solution B.I offers you the implementation of Microsoft reporting solutions, fully packaged in the same tool. The 100% compatibility of a Microsoft suite with a Windows architecture is ideal for Excel users, who will find the features and structure familiar. This last point is also key to the success of grasping the solution. Our expert BI consultants propose to implement within your structure Microsoft reporting solutions, which make possible the customizable creation of dashboards, with real-time access to them. 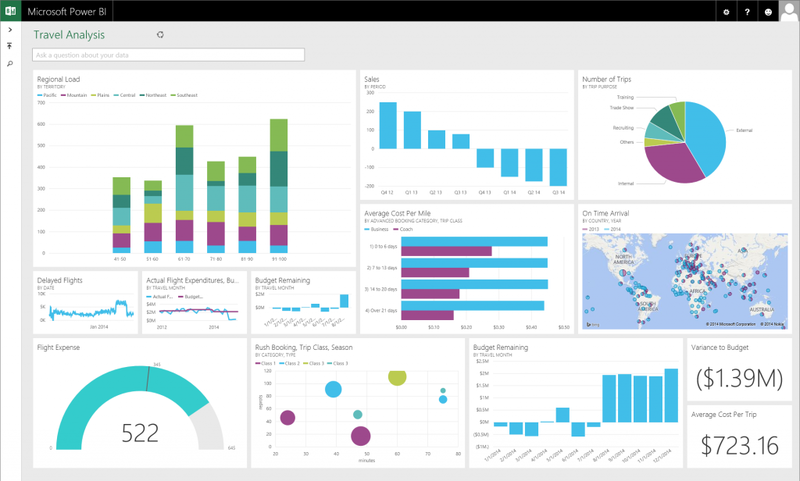 Power BI : an innovative and flexible tool suite that has the advantage of being adapted for mobile use in self-service BI mode. It allows you to be both consumer and developer of your data from an ergonomic and easy-to-use interface. SSRS : ( this BI solution supports large : volumes with a high-speed execution, thus managing the historicity of the data. Ideal for decision-makers who want structured reporting on all their activities over time: month-end analysis, daily reporting, sales summary for the current or previous years, etc.